Consider, finally, the case of Dada more generally. Tristan Tzara, for instance, another presumed progenitor of participatory aesthetics, in his 1916 “Note for the Bourgeois” describes “a poem based on new principles.” These principles “consist in the possibility of letting each listener make links with appropriate associations. 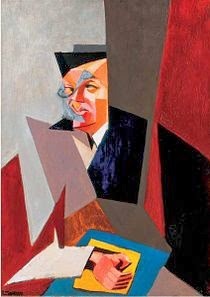 He retains the elements characteristic of his personality, mixes them, the fragments, etc., remaining at the same time in the direction the author has channeled.” Or consider Tzara’s infamous “Dada Poem” from the “1918 Manifesto”: “Take a newspaper. Take a pair of scissors. Choose an article as long as you are planning to make your poem. Cut out the article. Then cut out each of the words that make up this article and put them in a bag. Shake it gently. Then take out the scraps one after the other in the order in which they left the bag. Copy conscientiously. The poem will be like you.” Here, a set of ideas that seems to indicate how chance procedures produce non-intentional results ends up stating something like the opposite. Or consider from the same moment, Berlin Dadaist Johannes Baader’s 1918-19 letters to Raoul Hausmann’s wife, which have recently been claimed by Brigid Doherty as the origin of transactional or relational aesthetics. Baader opens the letter work to a range of rather new and seemingly chance phenomena: “The individual situation of the receiver, the addressee, the reader, the viewer, which assumes various forms according to mood, atmosphere, and time, was,” he says, “from the outset taken into account, and that expanded all the more the richness of what was being communicated.” How it is possible to take the reader’s “mood” into account when making a work is rather difficult to construe, and it shows the tension behind any notion of the “open” work, but that this Nietzschean “Super-Dada,” as he called himself, thought that he could is crucial to his claims and to Dada more generally. 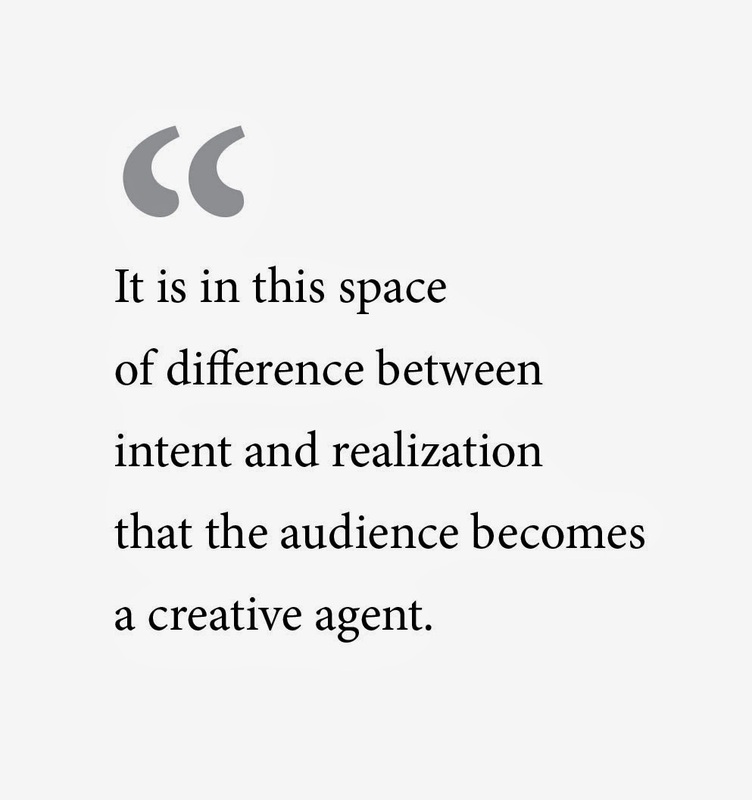 Following Baader, Walter Benjamin began to think of the reader/viewer as a producer, someone who makes the work in receiving it under new conditions of production. Technical reproduction, he writes, “can […] place a copy of the original in situations which the original itself cannot attain. Above all, it enables the original to meet the recipient halfway, whether in the form of a photograph or in that of a gramophone record. The cathedral leaves its site to be received in the studio of an art lover; the choral work performed in an auditorium or in the open air is enjoyed in a private room.” Nothing about this account, it should be clear, suggests that the original has actually changed its meaning in the reception; the artist’s work is just received by a whole new audience. But Benjamin does introduce something new when he writes in “The Author as Producer” that “a writer’s production must...place an improved apparatus at the reader’s disposal.” “This apparatus,” he continues, “will be the better...the more readers or spectators it turns into collaborators.” The notion that a reader is a collaborator is, I would suggest, a rather different claim from the one made by Mallarmé or Dada, and it finds its real inheritance in the work and writings of Duchamp. But as Duchamp quickly realized, there was a logical flaw to this “half way” position, one that gives equal share to artist and audience. Because if the artist was even half right about what the work meant, then any number of creative acts on the beholder’s part could be seen as creative in the bad sense, that is, simply mistaken. Duchamp’s commitment to the logic of participation went much further than his Symbolist models. Under a new set of terms Duchamp described the audience and the artist on the same level as creative receivers, neither one of which was interested in what the artist originally intended before he made the work. On this model, because an artist could not securely transmit his intentions to a beholder, his works functioned as nonintentional vehicles of “connotation—meaning that according to the observer’s imagination, he can go into any field or any form of imagination and associations of ideas he wants, depending on his own reactions. It was a sort of catalytic form in itself, ready to be accepted by everybody, or to be interpreted by the different temperaments of all the spectators.” There is a vast but unacknowledged gap between Duchamp’s initial claim that works of art are positioned “half way” between artist and audience and the one he came to make that the spectator was the work’s creator. So even though Duchamp invented, or nearly so, the audience as producer position, his primary claim about the “half way” status of art between artist and audience is as basic to modernism as the strong claim to autonomy cited earlier. What is common to Fairey and Eliasson, Cage and Rauschenberg, Benjamin and Duchamp, and uncommon to modernism, is a view of the world oriented around individual, affective response, one that in Branden Joseph’s words, “makes each beholder aware of the role played by his or her individual history and subject-position.” For those individual viewers, Rauschenberg says, “Every minute everything is different, everywhere. It’s all flowing. Where is the basis for criticism, for being right or wrong, without blindly or deliberately assuming or affecting a stop?” Participatory art imagines a world where every act of interpretation, an arbitrary stopping of the flow, is a violent act. For modernists like Babbitt, to whom the audience response didn’t matter to the meaning of the work of art, one could be right or wrong about its meaning, as that meaning doesn’t change with one’s response to it. Babbitt offers an allegory about the limitations of the Cagean commitment to affective response. He describes a situation in which a concertgoer emerges from a performance and declares his dissatisfaction: “I didn’t like it.” Given the nature of social conventions, the concertgoer is not pressed to provide reasons for his response. He then offers a different but related scenario. “Imagine, if you can, a layman chancing upon a lecture on ‘Pointwise Periodic Homeomorphisms.’ At the conclusion, he announces: ‘I didn’t like it.’” Unlike at the concert, where no one is pressed to support their evaluations of a performance, after the math lecture you are asked to justify your distaste. The layman is forced to publicly disclose his reasons for his dissatisfaction and this is what he said: “he found the hall chilly, the lecturer’s voice unpleasant, and he was suffering the digestive aftermath of a poor dinner. His interlocutor,” Babbitt concludes, “understandably disqualifies these reasons as irrelevant to the content and value of the lecture, and the development of mathematics is left undisturbed.” Babbitt imagines works of art as kinds of objects to which your response is irrelevant to its meaning. The meaning of his compositions doesn’t change in your experience of them. Which is not to say, of course, that response doesn’t matter, only that it does matter insofar as your response was something the artist could have intended. On the other hand, chilly halls, gravelly voices, and what you had for lunch are as much a part of the meaning of 4’33” as they are of Eliasson’s Weather Project, because nothing is not part of their meaning. Then again, meaning is exactly not the word to describe what is happening at these events. After all, meaning can be disputed, while your digestive system cannot. And because nothing is not part of your experience, anything that would disqualify certain affects—such as meaning and interpretation—are replaced by differences—differences without disagreement. Perhaps then the problem with participatory art is not that it produces a world without disagreement but that it imagines that the world we live in is anything other than that. 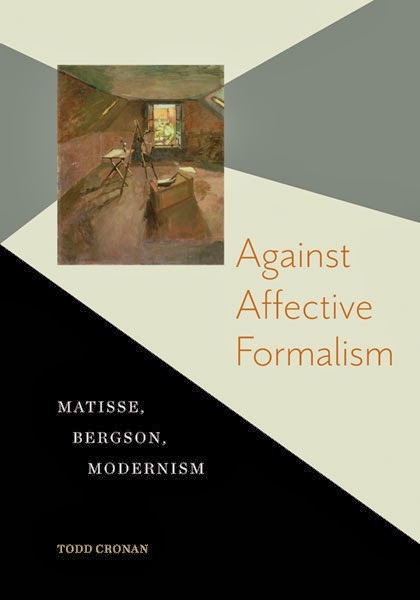 Todd Cronan is author of Against Affective Formalism: Matisse, Bergson, Modernism. He teaches modern European art at Emory University.